Metropolitan Police patrols took to the streets on 29 September 1829, despite resistance from certain elements of the community who saw them to be a threat to civil liberties. The initial force consisted of two Commissioners, eight Superintendents, 20 Inspectors, 88 Sergeants and 895 Constables. Patrolling the streets within a seven-mile (11 km) radius of Charing Cross, in order to prevent crime and pursue offenders. Between 1829 and 1830, 17 local divisions each with its own police station were established, each lettered A to V, allocating each London borough with a designated letter. These divisions were: A (Westminster); B (Chelsea); C (Mayfair and Soho); D (Marylebone); E (Holborn); F (Kensington); G (Kings Cross); H (Stepney); K (West Ham); L (Lambeth); M (Southwark); N (Islington); P (Peckham); R (Greenwich); S (Hampstead); T (Hammersmith) and V (Wandsworth). In 1865 three more divisions were created, W (Clapham); X (Willesden) and Y (Holloway); J Division (Bethnal Green) was added in 1886. On 28 June 1830, Constable Joseph Grantham became the first member of the force to be killed in the line of duty, an incident described by the Coroner's Inquest as "justifiable homicide". Other indications of the Constabulary's unpopularity of the time, were such nicknames as 'Raw Lobsters', 'Blue Devils' and 'Peel's Bloody Gang'. Officers were physically assaulted, others impaled, blinded, and on one occasion held down while a vehicle was driven over them. One of the priorities of the Metropolitan Police from the beginning was "maintaining public order", which they were active in doing, against the major Chartist demonstrations (1839–48) and the Bloody Sunday demonstration of the unemployed in Trafalgar Square in 1887. In 1839, the Bow Street Runners, the Foot and Horse Patrol and the Thames River Police were amalgamated with the Metropolitan Police. 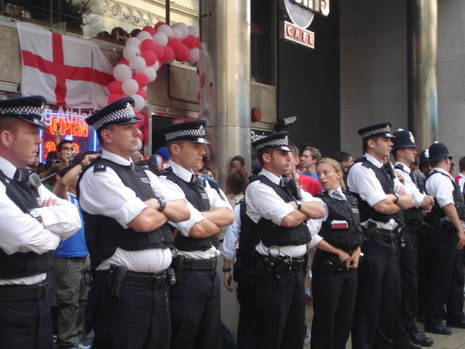 However, the City of London Police, created in the same year was an independent force. In 1842 taking over a function formerly the responsibility of the Runners, a new investigative force was formed as the "Detective Branch". And first consisted of; two Inspectors, six Sergeants and a number of Constables. 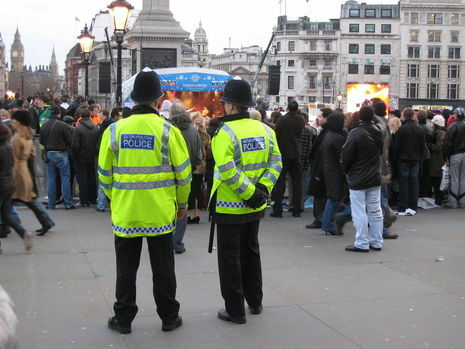 Before the passing of the Metropolitan Police Act, law enforcement among the general population was carried out by volunteer constables and "watchmen". In certain circumstances, such as serious public disorder the armed forces intervened. Because this system of policing was largely unorganised and lacked a criminal investigation capability, the novelist Henry Fielding (who had been appointed a Magistrate in 1748) introduced the first detective force, known as the Bow Street Runners, in 1753. Fielding's house at 4 Bow Street had been established as a courtroom by the previous owner, Sir Thomas de Veil, in 1739. Fielding's force was made up of eight Constables (that is, men empowered by law to enforce the decisions of the Magistrates) who also investigated crimes handed over to them by the volunteer constables and watchmen. Runners were identified by carrying a tipstaff with the Royal Crown on it, which had a compartment inside to store official identification and documents. In 1805 a Foot and Horse Patrol, the first form of uniformed policing seen in the capital, was established alongside the Runners, later amalgamating into the Metropolitan Police in 1839. Unofficial "thief-takers" operated independently from the Bow Street Runners, being employed by fee-paying members of the public to catch criminals and present them before a magistrate. By 1798, the year the Marine Police Force was established, salaried constables were being paid by local magistrates. The Marine Police was initially made up of 220 Constables assisted by 1,000 registered dock workers, and was responsible for preventing the theft of cargo. The London Marine Police Force is now widely regarded as being the first modern police force in the world, in the sense that they were not government controlled and were responsible for the prevention of crime. In its first year of operation 2,000 offenders were found guilty of theft from the docks. This success led to the enacting of the Marine Police Bill, which made it the first publicly funded preventive police force in the history of English policing. In 1839, the Marine Police amalgamated with the Metropolitan Police to form the Thames Division, being recently renamed to the Marine Policing Unit. Due to early forms of law enforcement lacking organisation and efficiency, it was often a source of public controversy. Because of this, a parliamentary committee was appointed to investigate the current system of policing. Upon Sir Robert Peel being appointed as Home Secretary in 1822, he established a second and more effective committee, and acted upon its findings. Robert Peel, believing that the way to standardise the police was to make it an official paid profession, to organise it in a civilian fashion, and to make it answerable to the public. After presenting his ideas to Parliament, they were approved and made official with the Metropolitan Police Act of 1829. During the early 19th century, the Industrial Revolution witnessed London becoming larger geographically and more significant economically. It became clear that the locally maintained system of volunteer constables and "watchmen" was ineffective, both in detecting and preventing crime. Due to this, Royal Assent was given to the Metropolitan Police Act on 19 June 1829, placing the policing arrangements for the capital directly under the control of Sir Robert Peel. Due to public fears concerning the deployment of the military in domestic matters, Robert Peel organised the force along civilian lines, rather than paramilitary. To appear neutral, the uniform was deliberately manufactured in blue, rather than red which was then a military colour, along with the officers being armed only with a wooden truncheon and a rattle to signal the need for assistance. Along with this, police ranks did not include military titles, with the exception of Sergeant. Despite the force not routinely carrying firearms, Sir Robert Peel authorised the Commissioner to purchase fifty flintlock pocket pistols. For use in exceptional circumstances, such as those which involved the use of firearms. As time progressed, the obsolete flintlocks were decommissioned from service, being superseded by early revolvers. At the time, burglary (or "house breaking" as it was then called) was a common problem for police. "House breakers" were usually armed, due to at the time it being legal for members of the public to own firearms. Following the deaths of officers by firearms on the outer districts of the metropolis, and after public calls debating whether the force should be armed, the Commissioner applied to Robert Peel for authorisation to supply officers on the outer districts with revolvers. The authorisation was issued on the condition that, revolvers would only be issued if, in the opinion of the senior officer, the officer could be trusted to use it safely, and with discretion. From then, officers who felt the need to be armed, could be so. The practice lasted until 1936, although the vast majority of the system was phased out by the end of the 19th century. During the 1860s, the flintlock pistols that had been purchased in 1829 were decommissioned from service, being superseded by 622 Adams revolvers firing the .450 cartridge which were loaned from the army stores at the Tower of London following the Clerkenwell bombing. In 1883, a ballot was carried out to gather information on officers' views on whether they wished to be armed, and 4430 out of 6325 officers serving on outer divisions requested to be issued with revolvers. The now obsolete Adams revolver was returned to stores for emergencies, and the Bulldog 'Metropolitan Police' revolver was issued to officers on the outer districts who felt the need to be armed. On the night of 18 February 1887 PC 52206 Henry Owen became the first officer to fire a revolver while on duty, doing so after he was unable to alert the owners a premises on fire. Following the Siege of Sidney Street, one thousand self-loading Webley & Scott pistols were purchased. In 1914 the Bulldogs were withdrawn from service and returned to stores. Lord Trenchard standardised the issue of pistols among divisions with the size of the area depending on the amount of firearms; ten pistols with 320 rounds of ammunition were issued to divisional stations, six pistols with 192 rounds per sub-divisional station, and three pistols with 96 rounds to each section station. In 1936 the authorisation to carry revolvers on outer districts was revoked, and at the same time Canadian Ross rifles were purchased in the prelude to the Second World War. In 1952 following the Derek Bentley case, when an officer was shot dead, 15% of firearms in service with the Metropolitan Police were found to be defective, leading to Special Branch and Royalty Protection Officers being armed with an early version of the Beretta automatic pistol. The original headquarters of the newly formed Metropolitan Police was located near Government, at 4 Whitehall Place, with a back entrance on Scotland Yard. This latter name soon became established within the public discourse, as a name for the force itself. Once formed, the force become the third official non-paramilitary city police force in the world, after the City of Glasgow Police and the Paris Police. The original standard wage for a Constable was one guinea (£1.05) a week. Recruitment criteria required applicants to be under the age of 35, in good health, and to be at least 5 ft 7 in (1.7m). Working shifts lasted 12 hours, 6 days a week, with Sunday as a rest day. Until 1897, Metropolitan Police officers did not receive a boot allowance. From the Metropolitan Police's foundation, the force had relied on the use of hand rattles for officers to signal the need for assistance. In 1884 the Home Secretary invited competition from many companies to invent a "police whistle" to replace the rattle. J.Hudson & Company of Birmingham were awarded the contract for 7,175 whistles at the price of 11d each. At the same time, a competition for the contract to supply the Metropolitan Police with new truncheons was under way. This contract was won by Ross & Company, who supplied the Metropolitan Police with Lignum vitae truncheons. In 1886, during a riot between warring working parties in Hyde Park, many truncheons were damaged or broken, samples were sent off to be tested by the Royal Army Clothing Department, at a cost of 16 shillings per day. In October 1886, 900 pounds worth of Lance and Cocuswood were purchased, to use in place of Lignum vitae that was deemed unsuitable after Army testing. Since the MPS's inception, the force has been headed by a Commissioner, rather than a Chief Constable which is the highest rank in police forces outside of London. The first Commissioners to hold the post were Lieutenant-Colonel Sir Charles Rowan and Sir Richard Mayne. When Sir Charles Rowan died, leaving Sir Richard Mayne as the surviving Commissioner, Captain William Hay was drafted in to jointly run the force with Mayne. However, because the two Commissioners did not agree on methods of running the force, since 1855 it was decided that only one Commissioner would run the force.